Long-time Lowell political observer Kendall Wallace shares his thoughts on the upcoming Democratic Primary in the 3rd Congressional District. The crowded primary field for the Democratic Party nomination for congress in the Third Congressional District has some pretty talented people who would like to replace Niki Tsongas. The diverse group includes five men and four women, some with deep ties to various communities in the district and some fairly new to the region. Three candidates, Dan Koh, Rufus Gifford and Lori Trahan have already raised more than $1 million dollars for their campaigns; Barbara L’Italien has raised more than $700,000; and Beej Das is close to $600,000. Money, geography, roots and voter turnout are all key factors in a race since most of these candidates agree on the major issues. With four women in the race it would be a huge help if one is able to become clearly the woman who has the best chance of holding the seat now held by a woman. Trahan and L’Italien have done well in fund raising, but Juana Matias ($472,000), Alexandra Chandler ($109,000), and Botha Malone ($70,000) all have great resumes. Geography has an interesting history in the old Fifth and current Third Congressional District, which over time has shifted both east and west with redistricting and population decline relative to other areas. The the Lawrence area had its own congressional seat until the early 1960’s when it was merged with the Lowell area. Later the district expanded further west with Fitchburg and Gardner becoming part of what is now the Third District. The most interesting statistic to me finds for about 90 percent of the last 100 years the member of Congress for this district carried a Lowell address. In fact, for most of that time the Representative in Congress lived in the same neighborhood—Belvidere. Since 1912, Congressman John Jacob Rogers, Congresswoman Edith Nourse Rogers, Congressman Paul E. Tsongas Congressman Martin T. Meehan and Congresswoman Niki Tsongas, all lived within a few blocks from each other. Congressman F. Bradford Morse, who served for 12 years, was a Lowell resident but lived in the Christian Hill neighborhood. In relatively modern times, only Chester Atkins from Concord, Jim Shannon from Lawrence, and Paul Cronin from Andover, broke the pattern. Geography clearly plays a big role when it comes to picking a Congressman. While Beej Das now has a Lowell address, he only moved here at the start of the campaign. Lori Trahan is the Lowell native. 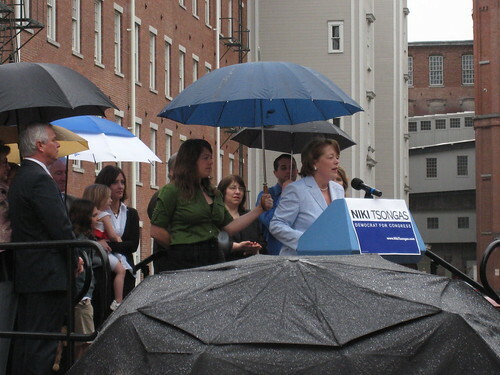 Trahan was born and raised in Lowell, went to Lowell Public schools and on to Georgetown. She also was the top aide for a number of years to then Congressman Marty Meehan. Trahan needs to clearly become the leading Lowell regional candidate. Her other task is to become identified as the strongest woman candidate in the field. She must also remain in the top tier of candidates with the most money in the final weeks of the campaign. Geography also needs to help State Senator Barbara L’Italien. She has a base in her Senate District, but all of her district is not in the Third District. It also appears she will split the heart of her district, the city of Lawrence, with Juana Matias, a popular State Representative from that city. Dan Koh, who lives in Andover, will also pick up a share of the Essex County end of the district. In a tight race, Trahan is hurt by the presence of Bopha Malone who, while not a resident of Lowell, has long been a community activist in the city (although Malone is trailing in fund raising by a wide margin). While Koh and Rufus Gifford are the leading fund raisers, they appear to have less of a base in the district. Gifford now lives in Concord and will do well in liberal parts of the district and will certainly have the money to brand himself over the next several weeks. The Koh family has strong ties in the Andover area, but he is more identified as a key staffer for Boston Mayor Marty Walsh. This primary reminds me of the 1972 Democratic primary, which featured a large field of candidates. In the end, that race came down to a close battle between then Lowell State Senator Paul Sheehy and John F. Kerry. Kerry was the face of the anti-Vietnam war movement and was regarded as a carpetbagger who was looking for a Congressional District to launch his political career. Kerry nosed out Sheehy in the primary, but lost the general election in what was one of the nastiest campaigns in local political history. I always felt Sheehy would have won the primary if there had been fewer local candidates on the ballot. Just as in 1972, turnout and where it comes from will be critical to the outcome of this year’s Democratic Primary. However, the ugly political climate in America has turned off a lot of voters which might keep turnout down on September 4. Last month in New York’s 14th Congressional District, Alexandria Ocasio-Cortez, a first time candidate, defeated Joe Crowley, a ten-term incumbent and Chair of the House Democratic Caucus in a midsummer primary in which only 11.8 percent of eligible voters cast a ballot. The New York result is compelling evidence that the Third District candidate with the best get-out-the-vote operation will win. The cities of Lowell, Lawrence, Haverhill and Fitchburg are depending on the election of a member of Congress who can deliver for them. I hope Kendall Wallace will continue to write about the Congressional race in the Third and offer observations based on his long experience. I’m sure he has thoughts about the state Senate campaign to replace Sen. Donoghue and other local and regional campaigns. No discussion of issues here. I guess they don’t really matter. Great to read commentary from Kendal Wallace once again. Such a differcult race to predict due to the early preliminary voting date,who will vote?. This is also the first contested democratic primary race with the route 2 corridor in the district. Looking forward to Kendal’s thoughts going forward.